A couple months ago, we decided that the timing and circumstances were finally right for us to take the plunge and start using an electric vehicle. A number of friends and family have asked about it, so I thought I’d put my thoughts down here for all to read. Long story short: We decided to lease a Nissan Leaf. We love the car and have even considered getting a second one. But to be clear, EVs are not currently for everyone – yet! We had been watching the Leaf since before it had even been released for sale in the U.S. in 2010, but a lot went into the decision to get an all-electric car, and specifically get the Leaf in particular. Fundamentally, and incontrovertibly, gasoline is a limited resource that pollutes the air. At some point, it will need to be replaced. There are lots of opinions about how and when that will happen, but regardless, we need to find an alternative, so why not get ahead of the curve and do it now? I won’t go into all of the advantages (or disadvantages) of using electricity as an energy storage and delivery mechanism, but some of the obvious ones include an existing delivery infrastructure and the ability to be cleanly generated at scale. We could have gone with a hybrid car, or even a plug-in hybrid, but deep down we felt the right thing to do was to commit to the cleanest vehicle we could manage. We wanted to show our support for what we felt was an important emerging technology. Driving an all-electric is a surprisingly awesome experience. First, it is noticeably incredibly quiet. We had relatives visiting, and my 6 year-old nephew commented on this (without prompting) as soon as we started moving. It’s so quiet that they have to add sounds (via external speakers) so pedestrians don’t get startled. When we test-drove a Prius plug-in hybrid, this was a big difference – what a noisy car. Second, it accelerates better than most gasmobiles. Yes, it really kicks it out of the gate. Third, it has no gears, so there are no funny shifting hesitations and all the power is instantly available. Fourth, it is much cheaper to refuel than gas cars, roughly a third the cost, and this drops even more if you have access to charging stations that are free to use. Finally, it gives you an incredible sense of satisfaction to know that you, personally, are not spewing harmful gases into the air (especially if your electric company offers clean energy). Clearly, an all-electric vehicle is not currently for everyone because the state of the art technology has some reduced functionality compared to gasmobiles: less range, longer refuel times, and a still-nascent refueling infrastructure. Even with government incentives, the current EVs on the market do not quite make a compelling case when you look at total cost of ownership, although they are close. All of these factors will change with time. My guess is that either for your next vehicle purchase or the one after that, an all-electric vehicle will be a contender. Right now, EVs are best as commuter cars (if your commute is less than about 35 miles each way, or, if you have access to a charging station near work, then about 70 miles), and for running errands around town. Taking a long trip in an EV would be a real hassle. But given that most households have over two cars, chances are good that at least one can be replaced by an EV, and the gasmobile can be used for any long trips (this is the route we’ve currently taken). EVs are also mostly for homeowners, because of proximity to electrical outlets when the vehicle is parked at home. We, of course, met all of these criteria, as do a lot of households. I am also very fortunate to get free, fast charging from my employer, which makes it even easier to stay “topped-off” at all times. Once we decided that it was time to replace one of our aging gasmobiles, an EV became the obvious choice. 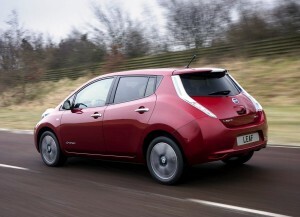 As a car, the Leaf in particular is an excellent vehicle, even if you ignore the fact that it is all-electric. It has all of the safety, reliability, and convenience features you’d expect from a new vehicle. It also has a greatly designed interior space (we like it much better than the Prius or the Focus), and some other cool features (like being able to control some functions like climate-control via an app). It is solid, reliable, and drives just like a regular car. Plus, it looks nice, is eminently practical, and priced right. Nissan has been a leader in the development of EVs, and has taken a big risk and put in a huge investment to be a pioneer. It’s clear they believe in the technology, and we wanted to show them our support. Taken together, all of these factors made the Leaf the best choice for us. We decided to lease the vehicle in anticipation of improvements in range and charging speed in the next few years. The great thing is, a lot of manufacturers are following Nissan’s (and to be fair, Tesla’s) lead. The Honda Fit EV, the Ford Focus EV, and the Mitsubishi MiEV are all currently available in some U.S. markets, with offerings from Chevy (Spark), Smart, and others just around the corner and new EVs getting announced all the time. Not only will this mean more choices for the consumer, but it will also put downward pressure on the pricetags, upward pressure on proliferation of charging stations, and drive innovation around range and charging times (e.g., battery-swapping facilities). In short, EVs are a technology whose time has come. To be sure, it will be a very long time before they are more prevalent than gasmobiles, and will likely never entirely replace them, but I see their widespread adoption as inevitable. We’re still on the low-end of the technology adoption curve, with less than 100,000 on the road in the U.S. today, but I liken them to cell-phones circa 1997. They are a proven, superior technology with support from the government and business. In a decade or two, all of the technical downsides to EVs will have been addressed, and public opinion will have turned against gasmobiles to the point where people who still hang on to them will be considered quaint, anachronistic, or just plain irresponsible. If you’re currently in the market for a car, I’d encourage you to consider if an EV is right for you. Take a few test drives – I think you’ll be impressed.